I’m not usually one for entering competitions, mainly because I always seem to miss the deadlines… I have every best intention, I diarise it, prioritise it, plan it, enter it, then realise I’ve left it a day late. I recently came across a stunning suitcase company called Suitcase Glory, who are also host to a superb blog with travel advice and reviews to boot and they recently hosted a giveaway to win not one, not two, but THREE of their stunning printed cases for one lucky entrant. What did I do? I had every best intention, I diarised it, prioritised it, wrote my entry, then realised I had left it a day late – naturally. With a recent visit to Leeds (I get to visit some pretty exotic locations, I tell you!) I had been caught up in my Penthouse accommodation and food geekery and by the time it came to writing and entering my post on board the “Vomit Comet” aka the Saturday night Leeds to London East Coast train, I opted to snooze into my first physical book in years, drifting in & out of sleepy consciousness for two hours. Instead of crying into my pot of tea about the lost opportunity today, I’ve decided to publish my planned entry regardless, in the vain hope that this wasn’t a complete wasted effort. I feel very inspired when I read a story of a new business owner turning their expertise and passions into a fully fledged business (see more on these sort of tales over at my business website, Stir Up Media) and Laura Daniel is no different in these stakes. 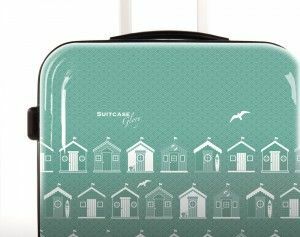 Laura has worked in the travel industry for years, picking off suitcase after suitcase from the convertor belts, she realised there was a gap in the market for more colourful and funky designs to spot in the blurred sea of suitcase normality. Starting with three simple, yet stunning designs, Laura has big plans for her company and the designs will grow over the coming years which is an exciting prospect indeed. At £129 per design, these aren’t the cheapest option, but in my opinion, their design is comfortable to carry or move around and they provide the user with a TSA-approved lock and a tough shell, sturdy enough to take the knocks and scrapes it may encounter as it flys around the world. So, my intention was not to tell you all that I’m a few weeks away from a luxurious break in the South of France, partnered with a frayed, “greying” black suitcase with some very sorry tales of “travel” to tell. No, I wanted to provide you with some of my recent nerdery learnt from my Royal tutor, to teach you all a few little tricks on how to pack your suitcase whilst headed to your very own luxury destination… You’ll be stocking up on tissue paper and sticky labels before you know it. So what’s so special about the designs at Suitcase Glory I hear you cry? Well, firstly, if I owned one of these beauties, it would mean I could incinerate the abomination I currently own and with THREE of them, I would have a different case for every trip within my “Around The World In 80 Stays challenge”, alternating them depending on my mood – who has that one luxury alone?! With the strapline: “Throw our your black or blue suitcase and join the revolution!”… I’m that exact person who would be actioning that EXACT motion. 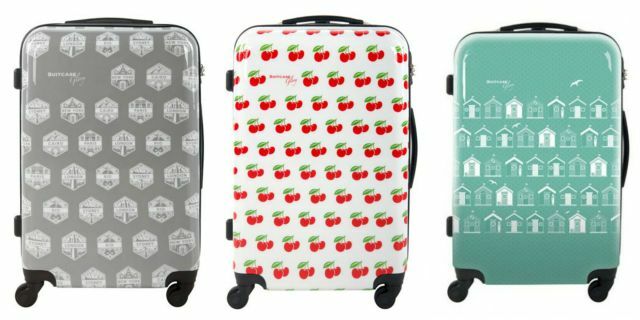 With the likes of Cherry Healey stating that she needs the cherry-printed suitcase in her life and a 12-month guarantee slapped onto these British-designed, four-wheeled, lightweight beauties, who wouldn’t want one?! With a current choice of patterns including a beach hut and even a travel stamp print, these cases will stand out on any airport conveyor belt, providing a very smug and swift collection in a sea of dull colours – I want one just to offer this smugness to my traveling companions just once! 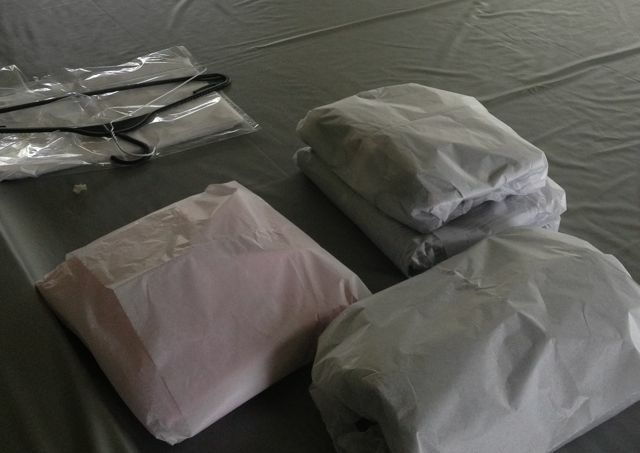 Firstly, we are always told to roll our items of clothing to avoid creases, but if you want to be crease-free the “Royal” way, you’ll get yourself a stream of tissue paper and will use this between folds to avoid those dreaded creases. When folding a shirt for example, place a sheet of tissue paper into the “back” of the shirt and fold around it, wrapping in tissue paper and sealing with a sticker (printed with your family crest as an optional extra!) for the paper will take on the creases as it travels. If traveling with a suit, instead of folding your suit jacket and packing it into your case, simply roll up sheets of the tissue paper and place inside the arms of the jacket to help keep their shape whilst compressed into a case. As soon as you arrive at your destination, taking out to hang will ensure limited creasing. Make use of the corners or edges of a suitcase, placing belts, makeup or toiletry bags, even underwear into these parts will use up space in those hard to use areas. If, like myself, you find it hard to feel at home until you’ve unpacked on arrival, simply place all “dressing table” items into one separate bag/compartment, all “bathroom” items into another, everything required for your first night (pyjamas, medication, toothbrush, etc), making life very simple on unpacking. Each bag goes directly to the right place within your accommodation and this saves much time rifling through the entire contents of your case. Don’t pack straight into your case, collect everything you need first of all and then assess what can be left behind if push comes to shove, you may find that you are packing items you don’t really need to be taking. It’s much easier to remove items from your list before packing it into your case. Consider a shoe bag for obvious reasons, or, if you don’t have such a bag, place shoes sole-to-sole to avoid dirtying anything else. Create an itemised packing list, take a copy with you so that you can check you have rounded everything up that you brought with you on leaving for home. 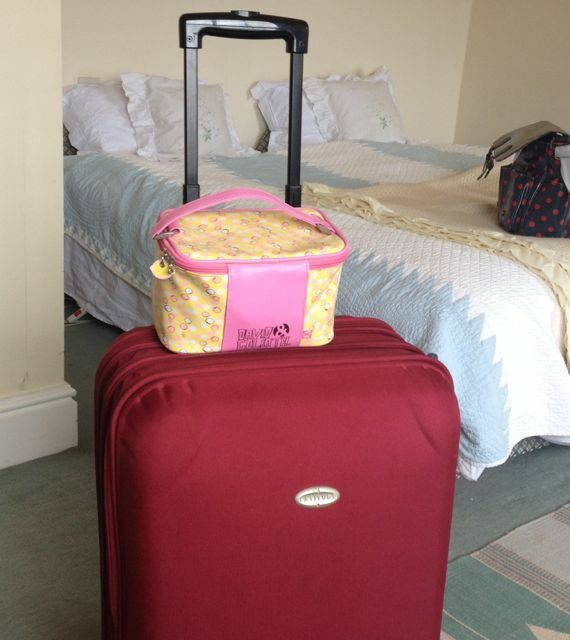 You can find a helpful packing list with Suitcase Glory to get you started. Think about what you are going to be actually using on your trip. If staying in a decent standard of accommodation, do you really NEED all of those shampoos/body potions/tissues or that hairdryer? Or will your room have all of this already? All of these items, once removed from your case can make a difference in added space, so pack wisely – most hotels will now state which of these items are provided within your stay. Don’t pack your sunglasses and suncream into your case, no matter how cold it is on leaving, if you’re headed to a hot location, you are going to need them as soon as you step onto the tarmac at the other end. On the flip side, you may have just visited tropic climes, but if headed back to blighty, that chill is going to hit you on landing, so have a pullover of some sort to wrap into as glamourously as humanly possible – be super organised, you’ll thank yourself! Leave a little room for keepsakes & souvenirs… You are always going to come back with more than you went with, no matter how hard you try not to! So, if you don’t want to be that crazy “bag juggler”, ensure some space is created for those unexpected extras in your return. If you STILL need some help on how to pack a suitcase, here’s a rather amusing retro video from Mr Bean himself on how NOT to pack a case…. Bon Voyage! Please Note: This is not a sponsored post in any way, I simply like the product being discussed and would like to share my tips with you for your own use and enjoyment. As part of this particular giveaway, a blog post was requested, so I have decided to post regardless, as I have in fact been meaning to write a packing guide for some time, so it fits perfectly. You can read more about my “Around The World In 80 Stays” challenge here!